How I Use Launch Center Pro – Sanspoint. Imagine, if you will, a second home screen for your iPhone that you can access with a single tap. “But, Richard,” you say, “my iPhone has as many home screens as I want, and I just have to swipe to get to them.” Indeed, you can, but all you can do from those home screens is launch apps. This home screen is different. It’s special. With two taps, you can speed dial your parents, search 1Password, search Wikipedia, toggle your screen brightness, or, yes, turn your phone into a flashlight. The problem it seems a lot of people have with Launch Center Pro is that it’s easy see to see the app as just a secondary home screen with less icons. Launch Center Pro is closer in concept to Quicksilver or LaunchBar. It allows you to do deep dives into applications in two taps that would normally take twice as many. It’s easier to go into Launch Center Pro, and tap the 1Password icon to get into a search than it is to launch 1Password and search for a login. An app with a good set of URL schemes can allow you to work magic, putting you two taps away from all sorts of things that would take longer to get to the old fashioned way. I do use Launch Center Pro as a basic app launcher. 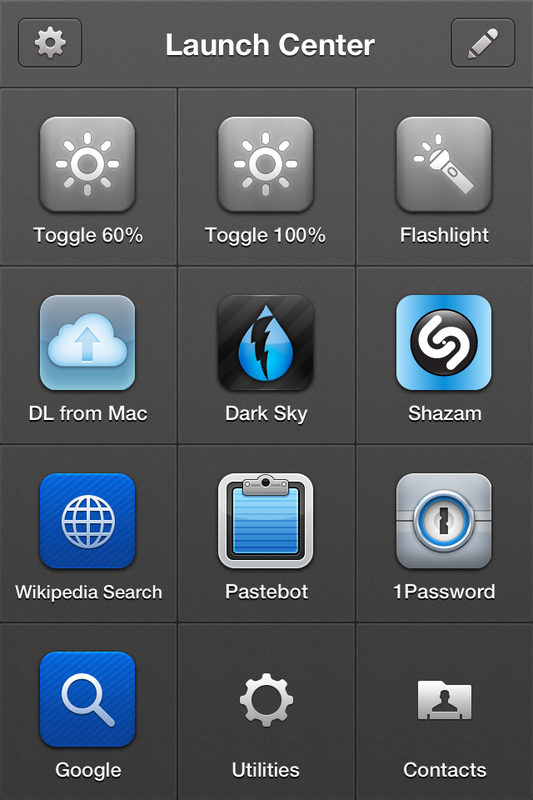 Three icons on the page are just quick access to apps that I don’t use often, but when I do use them, I want to get to them fast: Dark Sky (though this may fall to the wayside), Pastebot, and Shazam. This way, I can keep the actual apps stuffed away in a folder somewhere on my third page, and have easy access in just two taps. The spots they’d have taken up on page one or two now can belong to more important, more commonly used apps. Also, if there’s an app you want to run regularly, Launch Center Pro can schedule reminders, great for the “Call Home” action I have. 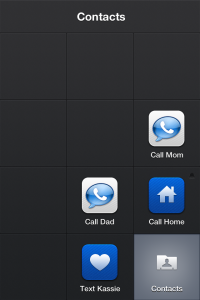 The power of Launch Center Pro, however, lies in its integration with other apps, and with the OS. 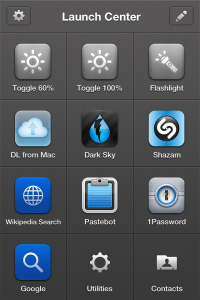 With the top row of buttons, I can switch brightness modes, or turn on the LCD flash. The brightness buttons are toggles: between 10% and 60%, and between 60% and 100%. Previous versions of Launch Center Pro had tighter OS integration, including the ability to turn on and off Wi-Fi, Bluetooth, and Airplane Mode—but Apple put the kibosh on that. The latest version includes support for in-app text messaging, e-mail, and calling. This means that you’re two taps away from a speed dial, or an instant text to your girlfriend that you’ll be late. Actions in Launch Center can access your clipboard, too. I use this with the app Transloader, so that if I come across something on my iPhone that I want to download on my Mac at home, I just need to copy the URL, open Launch Center Pro, and tap its icon. When I return to my Mac at home, the Transloader desktop app wakes up, and downloads it. Clipboard contents can be piped into anything that supports text in a URL, so you can copy text and have it land in any supported app, from OmniFocus, to Fantastical, to Drafts, to Safari And because it’s based entirely around URL schemes, this includes HTTP, so you’re two taps away from a Google or a Wikipedia prompt, both of which I use regularly. Launch Center Pro also allows you to group actions together in their own sub-home screen. Groups in Launch Center Pro work better than the default iOS folder implementation. Tap and hold on the group icon and slide your finger to what you want. I use it for my utilities and contacts screens, keeping me an extra tap from some useful apps like Deliveries, Text Expander, or the Google Authenticator, or from calling the folks. I’ve seen some folks with Launch Center Pro screens that are largely groups, which is great for clearing out the ol’ home screen. I’m just scratching the surface of what I can do with Launch Center. The list of supported apps shows just some of the possibilities, while Federico Viticci shows the power of URL schemes and cross-app integration in a post that breaks my brain. I’m often thinking about how I can improve how I use my iPhone and improving my Launch Center Pro setup is a large part of it.